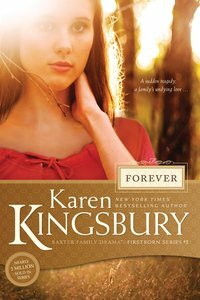 A fresh, new look for the bestselling Firstborn series?the second installment in the continuing Baxter Family Drama from America?s number one inspirational novelist, Karen Kingsbury. Revisit the Baxter family in all their life-changing events, or share the series with someone who hasn?t discovered it yet. Katy Hart is thrilled about her future with Hollywood?s Dayne Matthews. But as she plans a wedding and looks for a house on the shores of Lake Monroe, she receives tragic news. Now she and the Baxter family must travel to Los Angeles to sort through their options. While paparazzi hound them, Luke Baxter wrestles with feelings that have troubled him for nearly a year. Ultimately, the Baxters must pull together one last time in an act of service and love to help Katy and Dayne find what they?ve always been looking for?a chance at forever. About "Forever (#05 in Firstborn Series)"
Customer Reviews For "Forever (#05 in Firstborn Series)"
This series couldn't have ended in a better way! I love this story and all the twists and turns that come up throughout the novel. If you like the Dayne and Katie series - you have to read this one! A fresh new look for the bestselling Firstborn series?? ?the second installment in the continuing Baxter Family Drama from America?? ?s number one inspirational novelist, Karen Kingsbury. Revisit the Baxter family in all their life-changing events, or share the series with someone who hasn?? ?t discovered it yet. In this first book, Hollywood A-lister Dayne Matthews returns to LA after his shocking discovery in Karen?? ?s bestselling novel Reunion. Though his life is filled with fame, fortune, and paparazzi, his heart is pulling him toward a woman and a family who have no idea how their lives are tied to his. Meanwhile, Katy Hart has finally found contentment as the director of Christian Kids Theater in Bloomington, Indiana. But that changes in an instant when she meets Dayne Matthews and he promises a future she left in her past.